The Minnehaha Creek subwatershed encompasses all the Minnehaha Creek Watershed District (MCWD or District) downstream of the Grays Bay Dam and is commonly referred to as the "lower watershed." The cities of Plymouth, Wayzata, Minnetonka, St. Louis Park, Hopkins, Edina, Minneapolis, and Richfield have land within this subwatershed. The subwatershed, which includes the Minneapolis Chain of Lakes and Minnehaha Falls, is drained by the 22-mile long Minnehaha Creek and empties to the Mississippi River. Other major lakes in the subwatershed include Nokomis, Hiawatha, Diamond, and Powderhorn. Several other smaller lakes and wetlands dot the subwatershed. While some of the lakes meet their water quality goals, five lakes have been designated impaired for excess nutrients. Total Maximum Daily Load (TMDL) studies to diagnose the source of those excess nutrients have been completed and approved for Nokomis and Hiawatha for reducing nutrient loading and achieving water quality goals. The remaining three will be addressed when the MPCA cycles back to the Twin Cities area in 2020. Other concerns within the subwatershed are impairments for chloride, dissolved oxygen, fish and macroinvertebrate IBI, and bacteria. Read the Minnehaha Creek Subwatershed Plan from the MCWD Watershed Management Plan. 7341 Oxford Street, St. Louis Park. Minnehaha Creek is back at center stage in St. Louis Park. The Minnehaha Creek Preserve officially opened in July 2015, a major step in the renaissance of the iconic waterway and one of the largest urban stream restorations in Twin Cities history. 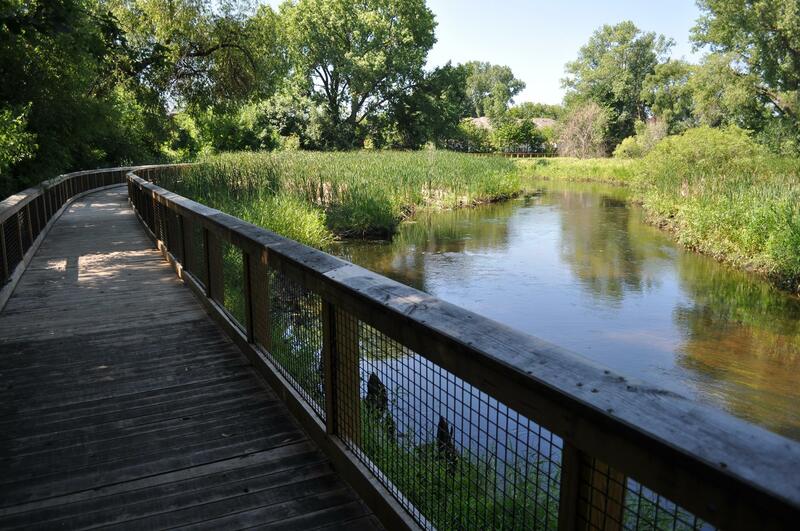 The Preserve features 2,200 feet of boardwalk and 4,600 feet of paved trail around a restored stretch of Minnehaha Creek between Meadowbrook Avenue and Louisiana Avenue in St. Louis Park. It is the cornerstone of the Minnehaha Greenway, a stretch of more than 109 acres of continuous green space constructed or planned for construction along Minnehaha Creek. The project is a partnership between the Minnehaha Creek Watershed District (MCWD) and the City of St. Louis Park that was financed, in part, by a grant from the Clean Water Fund. It is part of a larger effort to improve Minnehaha Creek through its most degraded stretch in St. Louis Park and Hopkins, where the stream had historically been straightened and hidden from sight. The Preserve creates access to 29 acres of green space that was previously inaccessible and provides a range of benefits for both water quality and the community. The restoration work, which was completed in 2013, returned natural curves to the previously-straightened stream, lengthening the creek by 1,600 feet. The project treats polluted stormwater from 79 acres of surrounding area that previously flowed untreated into the creek, prevents erosion by slowing down water, creates fish and wildlife habitat, and connects the creek to its historic wetlands. It has a significant impact on water quality in Minnehaha Creek and downstream Lake Hiawatha, both of which are on the state's list of impaired water bodies. An outdoor education area tells the story of the creek and how to protect it, and creates an outdoor classroom space for schools and community groups. Located behind Meadowbrook Manor, the trail system brings more than 600 housing units within walking distance of transit connections. There are locations for learning, sitting and peaceful reflection, as well as two new canoe launches. Additional support for the project was provided by Excelsior Townhomes, Japs-Olson Company, Meadowbrook Manor and the Minnetonka and St. Louis Park Sunrise Rotary Clubs. Created fish and wildlife habitat, and improve water quality. The trails can be accessed from three main trailheads, on the west, north and south sides. If you are driving, the easiest access point is at Creekside Park, 7341 Oxford Street, St. Louis Park, or from the south off Excelsior Boulevard. There is pedestrian access from the west where Powell Road crosses the creek on both the north and south sides, and from the east on Louisiana Avenue, just south of the creek. A full trail map is available as an attachment below.